Blindmaster has been supplying and installing Verosol pleated blinds for nearly 30 years and they remain as one of our most reliable and enduring window covering solutions. With many different highly functional style options, pleated blinds can achieve wide widths whilst maintaining the same slimline product profile dimensions and come in a variety of configurations and shapes to suit almost any window. The range of pleated blinds fabric from Verosol is extensive with four variations in density and almost limitless colour options. Verosol pleated blinds are available in an array of different shapes and configurations in order to accommodate even the most obscure window and the range is outlined in the Verosol pleated blinds overview brochure. 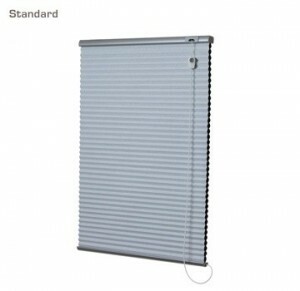 The Verosol standard pleated blind combines the soft appeal of a curtain with the versatility and simplicity of a blind. 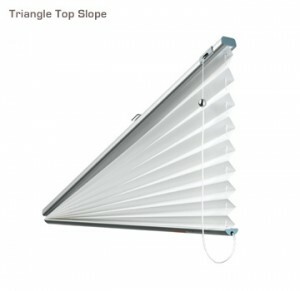 The ideal solution for heat and light control and the blind almost disappears when raised. Simple and elegant, with a small stack height and short projection, giving you an uninterrupted view from your home or office window. Adding guide wires is a great idea when installing blinds on internal doors, as well as an ideal solution for boats and motor homes. 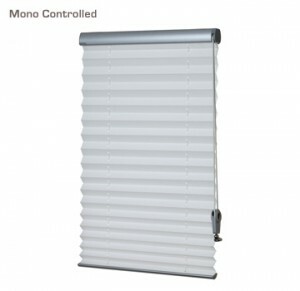 The Verosol mono control pleated blind is an ideal blind for large areas over 3400mm wide, as a standard cord lock mechanism ceases to work effectively at this size, the mono control system avoids the need to revert to duct and cleat systems. Available using a continuous cord loop or stainless steel chain continuous loop. The Verosol duo pleated blind gives you the option to raise the blind in the conventional way or drop it towards the window sill. 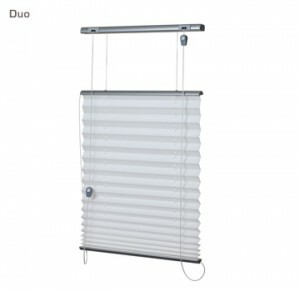 The duo pleated blind is an ideal solution where privacy and/or ventilation is required. 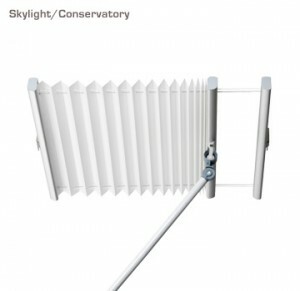 Useful for sash windows or when privacy is required down low but sunlight is required. 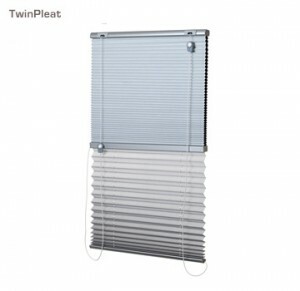 The Verosol twin pleated blind is a versatile blind practical for both day and night time use. A two-in-one pleated blind offering privacy without losing your view – select a sheer fabric and enjoy your day time view and a blockout fabric for room darkening and insulation at night. 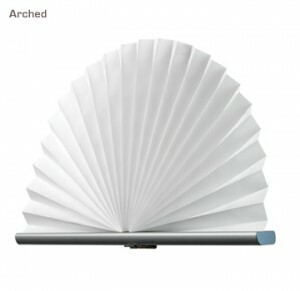 Ideal for rooms requiring extra light control for video screens and audio visual presentations. The Verosol conservatory/skylight pleated blind is a truly unique product for use on inclined windows such as conservatories or skylights. 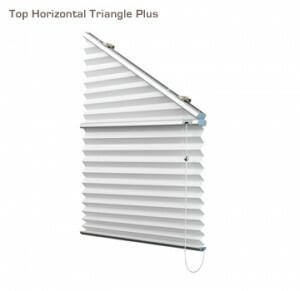 Not only is the blind kept in position by guide wires, but specially designed tension wires mean that the blind can be positioned at any degree of opening without falling down. For windows that are beyond hand reach, a wand is provided for easy operation and motorisation is optional. 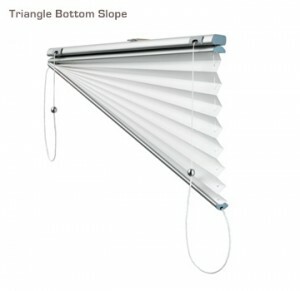 Verosol pleated blinds also come in a broad offering called special shaped pleated blinds. 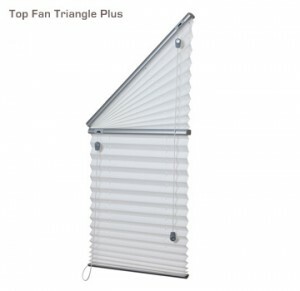 These special shapes include triangle fan top, triangle fan top with blind under, arched pleated, circular pleat, fixed frame pleat, triangle fan bottom slope & triangle horizontal top pleat with blind under. This is a perfect example of the versatility of pleated blinds in general. These options allow you to finish those awkward corners perfectly. Verosol’s range of pleated blind fabrics is extensive and includes 812 metallised semi-transparent, 815 ultra non-transparent, 816 metallised transparent, 850 mirage semi-transparent, 878 metallised non-transparent, 236 satin non-transparent, 982 metallised blockout, 400 verocell blockout and all fabrics are compliemented by a range of blind rail colours. The Verosol use, care & maintenance instructions – pleated blinds information sheet is a useful resource for owners of pleated blinds.